Soft cover, 192 pages Price: $16.95 plus shipping. ISBN# 978-1-929221-02-8 Library of Congress Catalog Card #: 2016910954 Author, Vivian Owens Revised edition: October, 2016 Available on Amazon or http://www.escharpublications.com ======= By Emerson Sandow Ms. Vivian Owens understands the world of parents teaching their children. Whether fully hands-on as in homeschooling, or as outside-of-school guides and co-teachers, she knows that parental involvement is the key to a child’s lifelong love of learning and satisfying an undying curiosity. Ms. Owens has written a number of books, some fiction, and two non-fiction that address teaching one’s own children. In Create a Math Environment, she offers short math lessons in a touchable, manipulative way, creating a three-dimensional connection to math concepts that will remain forever in the child’s mind and be the foundation of all future mathematics work. Ms. Owens book creates an entertaining learning environment that can make the student “forget” that s/he is learning something! – this is a great accomplishment and guarantees success in learning the lessons . . . we typically remember what we enjoy knowing. 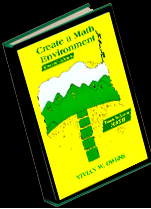 The newest edition of Create a Math Environment was released in October, 2016 and allows for flexible use – its lessons are arranged by age – which the homeschooling parent can use based on the child’s skill level, as homeschooled children often learn in different time-frames than schooled students. You can spend more time on a lesson or less; whatever suits your child. I urge parents to visit the Eschar Publishing website to see the complete line of books by Vivian Owens. Her fiction books will provide excellent story-time material for all ages of children and her other non-fiction tome, Parenting for Education is a valuable asset to all parents – homeschoolers or not. E.S.